So when I find a place that serves smaller lunches at a reasonable price, I’m happy. When that place is lovely inside with a nice relaxed atmosphere, I’m even happier. When the food is fresh, healthy and tasty, I’m even happier. Then when the place also has a wee little dog to play with too, I’m ecstatic. Granted, the last one may be more of a personal preference (I am quite the dog person), but you get the idea, No58 Speiserei is great. 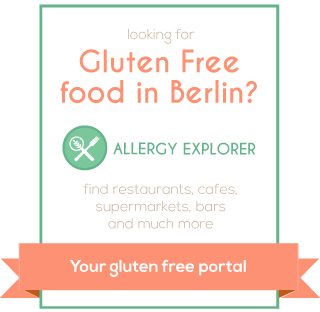 It is only a short walk from Bodinstrasse and not too far from Tempelhof Park (great for a digesting walk after). Inside you’ll find a cosy little place with lovely wooden tables. Not to mention all the cakes that they have out front. Plus the fact that they have gluten free beer. Yes, not strictly a lunch drink, but hey, they have it and that’s such a rare occurrence that you just have to drink one. It’s allowed. I have been there quite a few times now and I’ve never been disappointed in the food (well, ok, the vegan gluten free cheese cake I tried once was a little lacking, but that is a pretty difficult thing to make both vegan and gluten free). Mostly they have these amazing open top sandwiches. Just take a look! Along with soups and a larger dish, this one is Ratatouille. And this one is a rather amazing Lime-Coconut Rice with beans and a peanut sauce. So Delicious! So, in conclusion, you should definitely go and visit, often. The shear joy at being able to go every week and find a new dish that I can eat, plus a new cake, is just amazing. So far I’ve never had a bad meal there and never had a reaction to any of the food. Although it is worth pointing out that, when confirming a dish is gluten free, I have been asked “Is rice gluten free?”. Which, whilst a fair question in most circumstances, is not when you are serving gluten free food. It makes me worry that if they don’t know that rice is gluten free, what else are they missing when making the meals? I think this was just a one off oversight though (it was a Friday after all) and as I have never had a reaction to their food and knowing that they take care in the kitchen, I personally am not concerned. It is a little busy on the weekends so I’d arrive early if you can. Overall, I’m pretty sure it will become one of your favourite gluten free lunch places. Plus, whilst you’re there, give little Loki a scratch on the head from me.